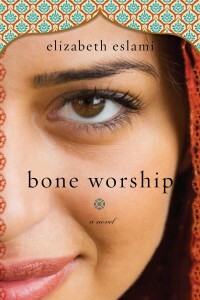 A stunning debut from Iranian-American author Elizabeth Eslami, Bone Worship dares to explore the perilous intersection of familial and cultural mysteries, balancing the pull of tradition, the promise of the future, and all the possibilities in between. Jasmine Fahroodhi sometimes worries she has a brain disorder. She doesn’t recognize her parents, and more startlingly, she doesn’t recognize herself. Half Iranian and half American, Jasmine doesn’t seem to feel at home anywhere. Professors marvel over an Iranian heritage she knows nothing about, while her American dates ask if her Iranian father is a terrorist. She has no friends outside of the laboratory, half of her relatives are missing from the family tree, and the only man she’s ever had a substantial relationship with is the mechanical phone voice asking her for a quarter. An ace student of zoology at the University of Chicago, Jasmine flunks out just shy of graduation after a disastrous romance, and returns home to live with her parents. Suddenly away from the stimulation of the city, she finds herself back in tiny Arrowhead, Georgia with no idea where her life is headed. Her enigmatic Iranian father and prim American mother have at least one idea: hastegar, an arranged marriage. Though repulsed by this idea, Jasmine lets her parents believe that she will go along with it, telling herself that it is just a matter of time until she can figure out how to proceed with her life. As her stories of Iran begin to resonate with her experience under her parents’ roof, she performs small acts of rebellion, cutting her hair and making desultory attempts at employment, fumbling toward an identity apart from two parents she’s never understood. All the while, Jasmine, a virgin, walks a tightrope, simultaneously dodging the impending marriage while also intrigued by the possibility of real love. Finally opening herself up to the mysteries of life and family, Jasmine ultimately discovers the truth about her father, and an even more evasive figure – herself – in this haunting and lyrical debut novel.